System reform of public procurement in Ukraine aiming to transform governmental tender processes into electronic format. 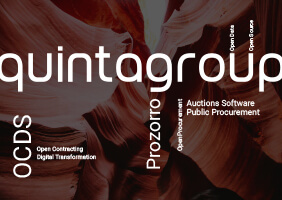 Quintagroup has developed and implemented e-Procurement solution - OpenProcurement toolkit - that was used by the Ukrainian electronic public procurement system - Prozorro. The main aim of Prozorro is to provide transparent and efficient spending of public funds and to prevent corruption through public control and bigger number of suppliers. 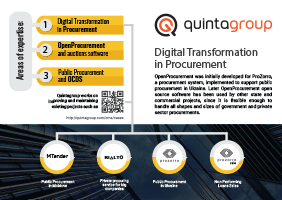 This new system strongly complies with the new approach to the issues of consistency of procurement procedures, evaluation of the tender proposals, transparency and openness of processes and information. Prozorro provides cross-access to the system. Users can see all procurements via their electronic platforms and suppliers can register their bid proposals to any procurement regardless of where the proposal was first announced. Competition between electronic platform will lead to the procurement service improvement. Fourteen e-Malls are already providing access to the system. What is more important, the project is open, so any electronic platform can join if it provides the necessary functionality. Among the procuring entities that use Prozorro are Ministry of Infrastructure, Ministry of Defence, Ministry of Justice, Ministry of Economy, State Management of Affairs, Ministry of Ecology, and many others. 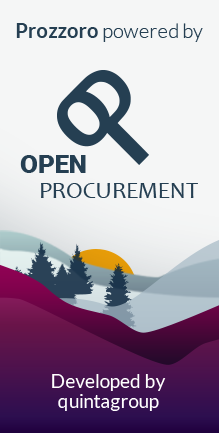 OpenProcurement’s Data Standard was harmonized with Open Contracting 1.0RC. These data standards were extended to ensure practical implementation of the procurement process in the Prozorro system. The toolkit’s code is open source and free, stored on Github: github.com/openprocurement. The documentation can be very useful for introduction. This solution is continuously tested and used in various areas of public procurement. 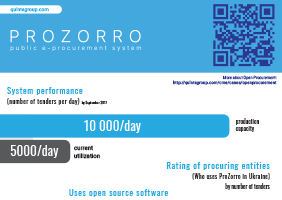 Ukrainian Prozorro reform has won the World Procurement Award (WPA) 2016 at Public Sector Awards in London, on May, 18 for design and implementation of an e-procurement system with a unique architecture and philosophy. Prozorro has received the distinguished international award - the annual prize of the Open Government Awards 2016 - during the Global Summit in Paris, France on December 7. Ukraine also gained special recognition for the involvement of youth in the project. 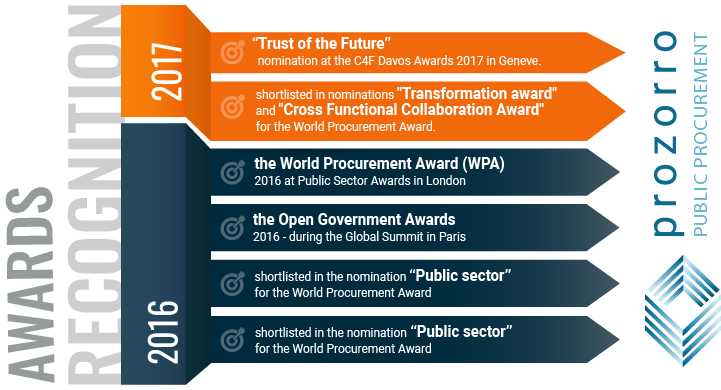 ProZorro was shortlisted during two nominations for the World Procurement Award. Also it became a showcase for the Open Contracting Partnership, a collaborative effort by the World Bank that promotes interest, openness and participation in public contracting.